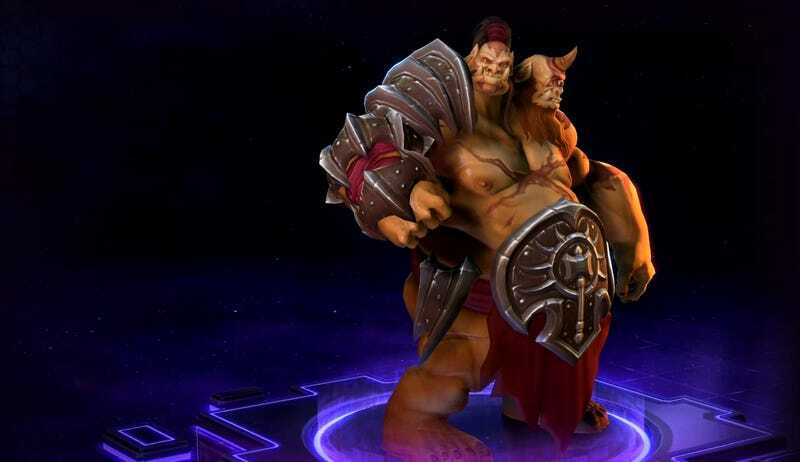 Heroes of the Storm is introducing a crazy new hero, Cho’gall, who’s controlled by two players at once. This has never been done before in any big MOBA—not DOTA, LoL, or HOTS. Hi everyone. Quick public service announcement: By this point in the post, you might have noticed that I’m not Yannick LeJacq, our resident MOBA maniac. We are united in goal and spirit, but not heart, body, or—most crucially—byline. Also, I don’t know; I guess I think Drake’s just alright. And yet, I’m writing about Heroes of the Storm, a complicated game I honestly don’t play all that much (yet). Because I’m at BlizzCon, and sometimes that’s just how these things shake out. Thank goodness for Cho’gall. He’s an ogre (think: big, with a belly that sways less like it’s full of jelly and more like it’s stuffed with rocks) with two heads, and two players control him at once. One plays as Cho, and they handle movement and a few basic attacks. The trickier elements of offense, meanwhile, go to Gall, who essentially rides shotgun while Cho drives. You’d think he’d be awful for beginners, given how convoluted and disjointed that all sounds. But actually, he’s pretty elegant to play once both players get the hang of their respective roles. It’s so much fun, especially if you’re prepared to talk a bunch with your comrade in arms, legs, and, you know, everything else. Plus, if you’re like me, you can have a more experienced friend handle decisions about which lane to push down, positioning, when to pursue side objectives, and so on. In my experience, it takes a tremendous amount of pressure off, and a friend can give you a sort of guided tour through the game while you kill stuff. Gall is a caster, so his main attacks are ranged. Shadow Flame is an aimed strike that’s not ultra powerful, but it’s good for engaging at mid-range or bringing down foes who are just about to escape from your web of dark magic and, uh, bile. Dread Orb lets Gall lob a bomb that bounces three times. As you level, you can modify it to do more damage on successive bounces and—to really trip people up—bounce backward. Recharge on both is only a couple seconds. Gall commands the mid-range, and Cho intercepts when opponents get up in your face(s). But they work together on one of their coolest attacks: Rune Bomb. It’s a rolling Indiana Jones boulder of destruction that Cho deploys at will. Now for the cool part: it’s then up to Gall to detonate it. At first I kept missing my cues, and before I knew it our bowling ball of arcane doom was sitting shamefully in the gutter. But once I started getting the timing down—keeping up my own attack rhythm while watching for the bomb—it felt great. I might have gotten a little too into it, what with all the cheering I was doing when I pulled off double kills. While my friend and I weren’t able to delve super deep into this, I noticed that Gall had the option to level in ways that buffed Cho’s Consuming Flame, a damage-over-time skill. We were having enough trouble communicating basic attacks and whatnot, so we didn’t really get around to coordinating talent builds. I did, however, take my friend’s cue and buff Rune Bomb as much as possible. By the time a match ended, we had it doing huge damage and coming back to us like a big bouncy boomerang. We talked a lot. Turns out, being conjoined to another person fosters communication. Who’d have thought? We were yelling and laughing back and forth for our whole match. “What lane do we want to push?” “Oh damn, nice kill!” “Aaaaaand detonate the bomb... NOW NOW NOW.” When we were really killing it, it felt like piloting a Pacific Rim mech. We moved in unison, with ballerina grace—on the legs of a belching half-naked man giant. After our match, a Blizzard employee told us we were the best Cho’gall team he’d seen all the day. I’m almost 100 percent certain he said that to everybody who played Cho’gall. Then again, we obliterated another Cho’gall, and we do finish each other’s sentences sometimes. Hmmmm. I’m planning to ask a bunch of people I’ve never met to play this character with me. Seems like a good way to get to know people. As a MOBA neophyte, I had tons of fun playing Cho’gall and riding shotgun (or, I suppose, being a shotgun) with more experienced players. I can’t give a super detailed breakdown of how I think he fits into the pre-existing meta since I don’t know it super well, but I’m concerned that he might be a bit too powerful, given how easily my friend and I were steamrolling people. Maybe the Blizzard employee wasn’t lying; maybe we really were that good—in perfect sync, like the Backstreet Boys. But it’s tough to say, given that I’ve only played a few matches as Cho’gall total—one of which my team lost pretty badly. We’ll see sometime this month, when Cho’gall goes live and people start spreading him around like a (cool) disease.